Point of view isn’t just a she said/I said decision. Where you place a story’s point of view will decide how the story can be told, the tone and voice it will have, and how your reader will experience (and enjoy) your work. In this discussion on the importance of point of view, we’ll talk about the impact this one element has on all the others, including character, setting, theme, and more. 3:45-4:45 pm – Interview and Q&A: ask her anything! Pick her brain for all kinds of writing advice. Lori Rader-Day’s debut mystery, The Black Hour, won the 2015 Anthony Award for Best First Novel and was a finalist for the 2015 Mary Higgins Clark Award. Her second novel, Little Pretty Things, won the 2016 Mary Higgins Clark Award and was a nominee for the Anthony Award for Best Paperback Original. Little Pretty Things was named a 2015 “most arresting crime novel” by Kirkus Reviews and one of the top ten crime novels of the year by Booklist. Her third novel, The Day I Died, was an Indie Next Pick and is a nominee for the Mary Higgins Clark Award and the Barry Award. She studied journalism at Ball State University and now lives in Chicago. All MWW13 attendees are eligible for a free, 50-minute Social Media Tutoring Session. As a writer, you are the owner of a small business called being yourself. As a professional-type person, it’s your responsibility to educate yourself about technology. Since technology is constantly changing, this means that that process of educating yourself will never stop happening. There’s no point in whining about this. Besides, learning new things is actually kind of fun. If you sign up, you’ll be helping a young person get real-world experience, which is part of the mission of Ball State University. I applied for a grant from the Discovery Group in Muncie to hire this highly skilled group of Ball State students as interns. Don’t feel guilty about pumping them for knowledge. They’re getting paid! So if you’re coming to Midwest Writers Workshop 2013, sign up! Tuesday, April 2, 2013, 7:30 p.m.
Vera Mae’s Bistro, 209 South Walnut Street, Muncie, Ind. 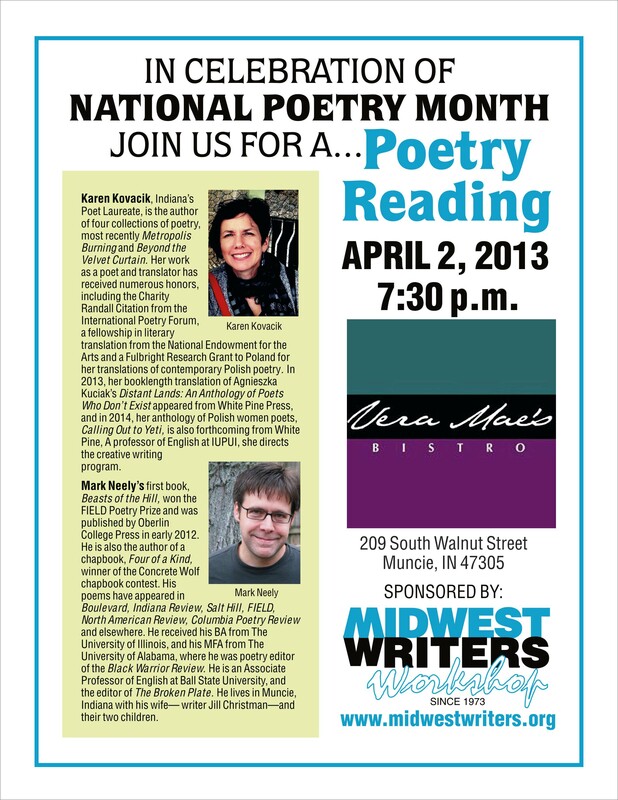 To celebrate April’s National Poetry Month, join us to hear Indiana’s Poet Laureate Karen Kovacik and poet Mark Neely. https://www.midwestwriters.org/wp-content/uploads/2018/08/mww-logo.png 0 0 Midwest Writers https://www.midwestwriters.org/wp-content/uploads/2018/08/mww-logo.png Midwest Writers2013-03-25 19:26:582013-03-25 19:26:58Hear Indiana's Poet Laureate! Social Media Consultants & FREE tutoring! Because MWW is committed to helping you become a published writer, we talk a lot about social media. That’s because changes in the publishing industry have forced writers to become “author-preneurs”-marketers, promoters, social media experts, and much more. At MWW, we know how time-consuming and confusing these tasks can be, and we want to help by offering free social media tutoring. Originally, we were going to require you to pay $35 per consult, but we decided it would be easier and more effective to run it more like a drop-in tutoring center. (Those who already signed up and paid will receive a refund.) Consultants will be available to show you how to start a blog and how to use Facebook and Twitter effectively. We’ll offer a limited number of tutorial sessions, so sign up for your 45-minute individual consultation. Bring your laptop and/or smartphone, and get ready to join the digital age! Last year, I was on the faculty at MWW and attended many of Jane Friedman’s panels on how to use social media. I looked around the room and saw people around my own age and older with stunned and frightened looks on their faces, and I thought to myself, “Oh, I know exactly how you feel!” I’m a latecomer to social media. My first forays went badly, and I experienced a profound sense of culture shock. (You can read about it here.) I turned to the young people in my life-my students-who showed me the ropes. I’m excited to introduce you to these four individuals. Let me tell you about each of them, and I think you’ll see why I selected them to work as social media consultants at MWW. Tyler Fields is in his third year at Ball State University, majoring in Creative Writing and Digital Publishing. He edits the BSU English Department Blog and is co-president of the Writers’ Community. Both of these positions require maintaining a social media presence and/or professional writing proficiency. Tyler has published both creative pieces and academic articles in various national journals and continues to assist Ball State faculty in their publishing endeavors. Tyler currently maintains several personal social media platforms including his website, LinkedIn, Tumblr, Twitter, and can be easily reached on Facebook. Q: Tyler, in a nutshell, why is it important for aspiring writers to maintain some kind of internet presence? A: The climate of writing, publishing, and reading is shifting drastically and swiftly. Unless a writer has become established before the surge of the internet and social media, it seems there is little to no hope for her to break out of the growing saturation of aspiring writers today. How is she to get notice from agents or presses? I think that because most communication has already shifted to internet-exclusivity, those aspiring writers who have yet to get connected are losing out on a myriad of opportunities. One is simply to create connections with other readers, writers, and publishers. Online, a writer is able to maintain connections with other hopefuls and established personnel. And as with any new prospect, it’s incredibly important to have already made connections with those people who can assist in your writing endeavors. Another opportunity exists in the recent push to publish online. I know of several authors who have been approached by agents from big and small presses to submit a novel manuscript based on their publications to online journals. Further, because it’s becoming simpler all the time to move forward as a writer without a middleman, many writers are taking advantage of the ability to push and market their work more quickly and efficiently. How do they do this? They have a prominent online presence. In the end, if a writer is able to create and maintain at least a semblance of an online presence, they increase their chances greatly to immerse themselves in the world of reading and writing which has largely taken to rely on the internet to provide new, upcoming, and promising writers. Q: Ashley, tell me a story about how social media has enriched your writing life, provided you with an opportunity you might not have had otherwise. A: Let me say that I have a wonderful group of writing friends and partners right here in Muncie. We share work, attend literary events together, and support one another through the toughest spots of our writing processes. However, it is through the online writing community that I’ve found ways to get my work into the world. About two years ago, I decided to follow and engage one of my favorite writers on twitter. I just wanted to let her know how much I enjoyed her work and how I found her to be inspirational. This led to her giving me the opportunity to read for a well-known literary magazine she edits. She went on to publish two of my essays in different venues. Through this relationship I have been introduced to other amazing writers, offered invaluable advice on writing and publishing, and she has become my writing mentor. All of this from a few initial tweets! I know not everyone is looking for a writing mentor, but through social media I have had the opportunity to have conversations with writers from around the world who I may never get the opportunity to meet in person. Some of them have even offered to read and critique my work. These connections are only possible via the internet and I plan on using them to their fullest potential. Spencer McNelly received his BA in Creative Writing from Ball State University where he was a tutor at The Writing Center, a member of Writers’ Community, and a copy editor for Stance, BSU’s international undergraduate philosophy journal. In addition to writing memoir and editing work, Spencer was Vice President of Spectrum, BSU’s GLBTQSA organization, where one responsibility was maintaining the Twitter account for the group. Spencer also blogs on Tumblr and can be reached on Facebook and @androgynisto on Twitter. A: Firstly, I would ask them who “they” is and secondly, I’d assure them that one doesn’t have to be a part of social media. It’s an important aspect of being a literary citizen, but not a requirement. I’d walk them through the three main appendages of social media: Facebook, Twitter, and eBlogger. If someone asked about using social media incorrectly, I’d discuss with them about their goals in being a part of social media. I’d assure them that there isn’t necessarily a wrong way of doing it, just a gap in not getting what one wants from it. Q: Maye, one reason why I selected you is that, unlike the other consultants, you’re not Generation Y. You’re not someone who’s grown up using technology and social media. Like a lot of MWW attendees, you’ve had to learn how to incorporate this into your personal and professional life. What advice do you have for the aspiring writer who’s nervous about dipping their toe into these waters? A: Trying something new can be confusing, frustrating, and very time consuming. Certainly it can be risky. Especially if one has already acquired a certain amount of professional reputation capital, it can be intimidating to risk that capital in a technological wilderness. I wish I had had someone to guide me when I first started using online tools and media, it would have saved me hours (months really) of hard and frustrating work. As to the risk: not venturing into new tools and technology can also be risky, as the world may well leave one behind, mired in the muck (yes I love clichés) of outdated methodologies. It is a fact of modern life that technologies will change the way we live and work, at ever decreasing intervals. Keeping up necessarily means taking risks, and that means making mistakes. The good news is that even new media “experts” make mistakes, so we are all in good company. If we desire to remain industry viable, anything we can do to shorten the learning curve in order to get back to our real passion (writing) is worth every penny, and every effort, we spend on it. The consultants have some questions they’d like you to consider before you arrive at MWW 12 and sign up for an appointment with them. Do you have: a Facebook profile, Twitter account, LinkedIn account, a blog? Are you active on these accounts? How active? How long have you been using them? Are these accounts primarily for personal or professional use? Or both? Are you connected to other writers and publishing personnel? What is the topic of your blog, if there is a topic or focus? How many followers does your blog have? And whose blogs do YOU follow? Do you know how many followers/friends/connections you have on LinkedIn, Twitter, or Facebook? Are your followers mostly friends and family members, or are they also professional connections? About what percentage of each are there? What 1 or 2 things do you most want to learn during your tutoring session? Be sure to come to the session with a plan, your passwords, and a digital headshot photo.